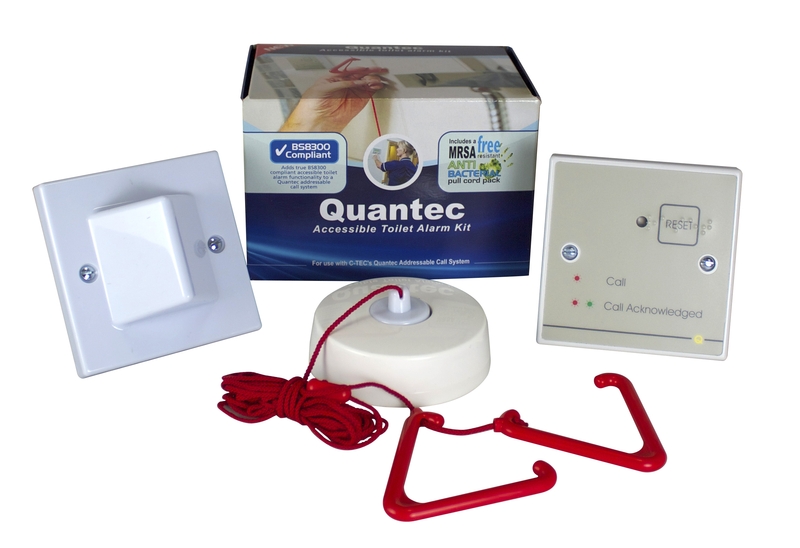 A cost-effective expansion kit that adds true BS8300 compliant accessible toilet alarm functionality to a Quantec Addressable Call System. Includes a QT607 ceiling pull unit, a QT605S reset point c/w confidence sounder, a Quantec slave overdoor light c/w sounder and an NC949 Accessible Toilet Sticker. Allows people in distress to call for help quickly and easily. Call acknowledgement function provides audible & visual feedback inside the WC that help is on the way (see Operation section below). Staff can 'Accept' alarm calls at a Quantec display. 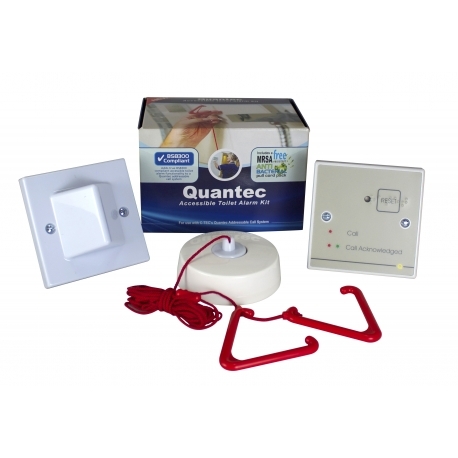 Multiple kits can be used on one Quantec system. 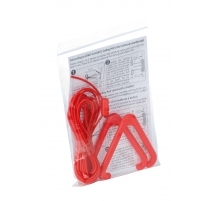 Includes a free MRSA resistant anti-bacterial pull cord pack (for a limited period only). Must be used in conjunction with at least one Quantec Controller. Mains supply Power derived from main QT601-2 Quantec Controller (not supplied). Total output current limited to N/A. Max battery size and type An optional standby battery supply (2 x 12V 7Ah VRLA) can be connected at the main QT601-2 Quantec Controller, not supplied. Alarm current Less than 30mA (all QT951 devices). Auxiliary relays N/A. 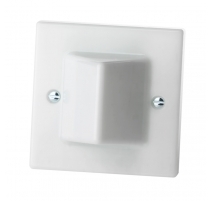 However optional QT612 Relay Output Devices can be connected to the Quantec network/wiring. Indicators QT607 has a red Reassurance LED; QT605S has a red/green Reassurance LED; QT606S has twin red/green Alarm LEDs. Controls QT607 Ceiling pull activated by two pull cord bangles. QT605S has a Reset button. 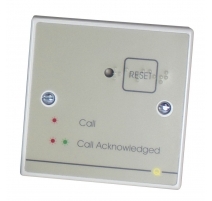 Call "Accept" function can be carried out at a Quantec Display (not supplied). Expansion connections N/A. However additional call and indicating devices can be connected to the Quantec network/wiring. Onboard Sounder Yes (on QT605S and QT606S). Product dimensions (mm) 87 W x 87 H x 68 D (QT606S); 87 W x 87 H x 24 D (QT605S). Ceiling pull measures 93mm diameter x 27 D.
Packaging dimensions (mm) 143 W x 96 H x 102 D mm (size of QT951 kit box containing all items). IP Rating IP41 (QT606S); IP40 (QT605S); IP21 (QT607). Notes The QT951 is an expansion kit designed for use with Quantec Addressable Call Systems. It must be used in conjunction with at least one QT601-2 Quantec Controller. 1. 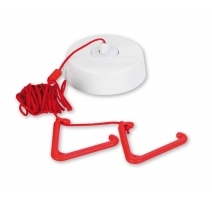 The distressed person raises an alarm by pulling the cord on the QT607 Ceiling Pull Unit. • The red reassurance LED on the QT607 Ceiling Pull Unit and the reassurance LED and sounder on the QT605S Reset Point c/w Sounder pulse Quantec's standard call sequence (0.5 seconds on and 0.5 seconds off) to reassure the user the call has been registered. • The Alarm LEDs and sounder on the QT606S Overdoor Light c/w Sounder pulse Quantec's standard call sequence (0.5 seconds on, 0.5 seconds off) and a message appears on all relevant Quantec displays (as programmed) to let staff know someone is in need of assistance. • The reassurance LED and sounder on the QT605S Reset Point c/w Sounder pulse Quantec's Call Acknowledged sequence (0.5 seconds on, 3 seconds off, red/green) to let the user know help is on the way. • All relevant indicators, display messages and sounders are extinguished and the calling device returns to its normal state. If the RESET button on the QT605S is NOT pressed when in the call acknowledged state, after a period of 1 to 8 minutes (as programmed) it generates another Alarm/Standard call on the system.